With August well underway, our garden is in full swing producing beautiful dahlias and zinnias, plus delicious cucumbers, carrots, tomatoes, jalapeños, peppers, onions, potatoes! 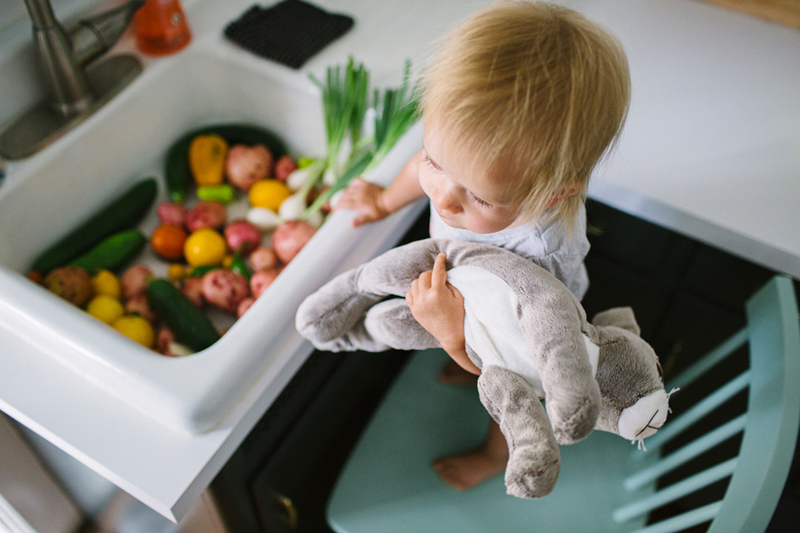 June loves when I wash off the days fresh veggies in the sink and was begging to stand at the sink and see them when she woke up from her nap the other day. June quickly learned that those potatoes turn into delicious rosemary fries and holds out the potatoes and goes "friiieshhhh!" She also gathers up the potatoes and sits on the couch with them.. just holding them in her lap. We call them her "couch potatoes." 😂 She also eats the cherry tomatoes right off the vine like little grapes and squints her eyes with delight when the tomato pops in her mouth! Side note, have you ever planted potatoes before? This was my first year and I loved it! I wish I had done like 5x the amount! They're so good and easy to take care of. Next year I'm definitely going to plant more.